"I mean, if life is crummy, don't expect life to be great just because you wished on a shooting star. It's just a meteor meeting the Earth's atmosphere...There's nothing magical about it. It's just science." Indie Chickory has always lived with her head in the clouds. But after a day of one too many mishaps, including the disappearance of a beloved pet, Indie convinces herself it's time to join the real world. She'll enter 6th grade in the fall, so this is the perfect summer to re-invent herself and, hopefully, grow closer to her sister, Bebe. On her way to normalcy, Indie meets Owen. Owen is just in town for the summer. He's a quirky kid, like Indie is, er was. His "observational log" is full of notes about inventions, people he's met, and anything that catches his interest. He and Indie quickly hit it off. But for new Indie that could prove to be a problem. Moulton's Tracing Stars captures the sister's relationship perfectly. Bebe and Indie struggle between pulling together and pulling apart as they each try to find their own identities. Bebe, being the oldest, has slightly more pull, and she uses that, sometimes to Indie's detriment. I love the seaside town descriptions. Moulton's writing clearly describes the shops, the streets, and the wonderful tree house that Indie and Owen modify. Tracing Stars builds in an unhurried summery style. Moulton uncovers the true Indie Chickory for us, warts and all. She's a real girl with real problems and makes decisions we may not agree with but makes sense for who she is. I recommend this one and would buy 4 copies. Definitely one for a 4 - 6th grade book club to read and discuss. I would pair it with Nice and Mean by Jessica Leader. Erin E. Moulton graduated with an MFA in Writing for Children from the Vermont College of Fine Arts in 2007. She is the author of Flutter: The Story of Four Sisters and An Incredible Journey (Philomel/Penguin 2011), and Tracing Stars (Philomel/Penguin 2012). Erin is co-founder of the Kinship Writers Association and is currently the YA librarian at the Derry Public Library. Erin lives in Southern New Hampshire with her husband and puppy where she writes, reads, drinks tea and dreams. You can visit her online at www.erinemoulton.com or on Facebook as Erin E. Moulton (Author), or find her on twitter @erinemoulton. Check out my interview with Erin E Moulton. 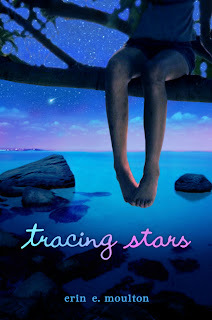 Would you like a signed hardcover of Tracing Stars?